We spent a drizzly day in Atlanta yesterday. 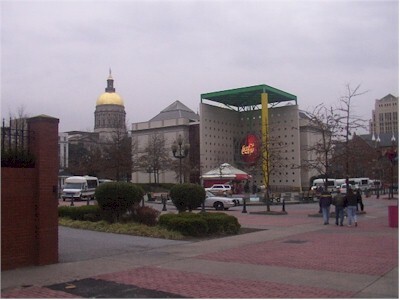 Here's a nice picture of the Capitol, which is the gold-domed building on the left (not the World of Coca Cola building). Today we watched Scott's team win a couple of basketball games. In the first one, his team get ahead 48-8, after which the scorekeeper decided to turn off the scoreboard. Scott scored 8 points in the game.